Queen Victoria started the first appeal with a £20 donation. The Times stepped into the breach 50 years later to ensure the adjoining field was not lost. Now the custodians of John Milton’s cottage want the public to show their generosity to stave off the ravages of a financial squeeze. 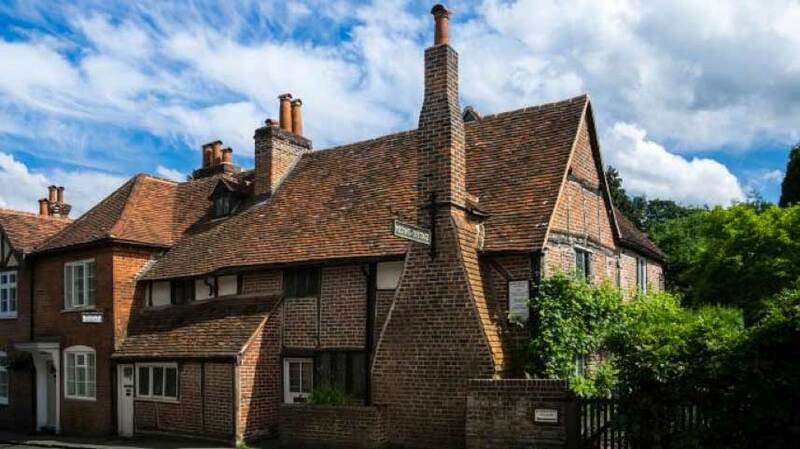 The 16th-century cottage in Chalfont St Giles, Buckinghamshire, was where the writer retreated from the plague and his enemies so that he could complete his masterpiece, Paradise Lost. It is now home, according to Simon Avery, the chairman of Milton Cottage Trust, to the world’s biggest collection of first and early editions of his work on permanent public display. It also holds a lock of the writer’s hair. Museums across the country are struggling with funding cuts and a fall in donations from private institutions and individuals. Mr Avery said that since the financial crisis “money is tight” at Milton’s house, which depends on visitor fees, donations and bequests. Amid warnings that the trust would run out of money by the end of next year, it has launched an endowment fund campaign, with the backing of the Heritage Lottery Fund, entitled Paradise Maintain’d, with the aim of raising £3.5 million to preserve the house in perpetuity for future generations. This Sunday, to highlight the campaign and the 350th anniversary of the publication of the epic poem, there will be an 11-hour recital of the 10,000 lines of verse of Paradise Lost at the cottage and its gardens. Mr Avery said that the income generated from the public would “enable us to protect this unique literary landmark for future generations as well as engage people with Milton’s legacy in new ways”. The writer decamped to the cottage after the Restoration in 1660. He lived there for only two years but during that time completed his most famous work. 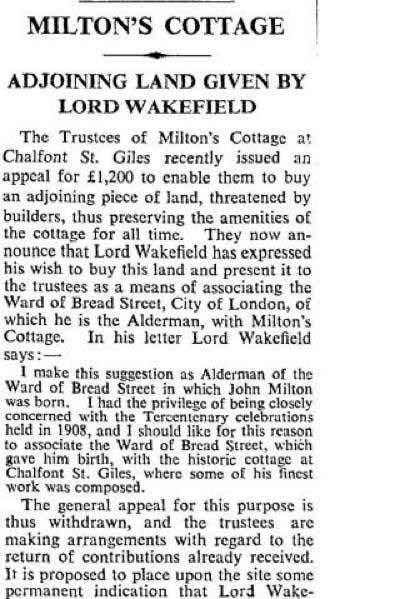 In 1887 Queen Victoria lent her support to the Chalfont St Giles elders as they attempted to save the cottage from being transported to the United States, where Milton was a major influence on the Founding Fathers. 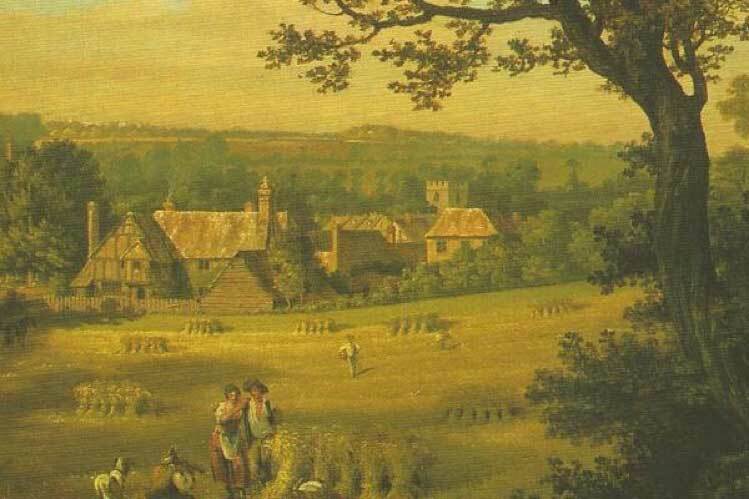 Half a century later The Times helped with a successful fundraising campaign to save the adjoining field from developers who were threatening to ruin the view of the cottage, as caught by Thomas Jones’s painting circa 1770. Mr Avery pointed out that Milton is credited with inventing more English words than Shakespeare, with “outer space” and “pandaemonium” both originating in Paradise Lost.